What’s Your Strategy to Engage Your Influencers? It’s the end of the year. Maybe you are taking a look around at all the work that you and your team did this year and you wonder: What exactly did we do? In the talent acquisition marketing space, you posted a million jobs to thousands of job boards, and worked on your branding, social media, website, printed materials and events. It was a lot of work, and through a certain lens, it can be boiled down to a single idea: You spent a lot of time helping your company talk about itself. And that’s what marketing is, right? You tell your story and tell it over and over again on all the various platforms and channels and hope that at the end of the day, all your talking got people interested in your company. Let’s assume you are trying to create the impression that your company is serious about technological innovation, specifically among its staff. You could write a lot of social posts that tell stories about how employees get access to the newest tech, that they are attending or speaking at tech conferences, and that your staff convenes at an internal yearly tech retreat where you talk about technological changes and how you can take advantage of them. The problem isn’t what you’re saying; it’s that you’re the one saying it. At some point, people start tuning out the person who keeps talking about him or herself, and your marketing is no exception. Eventually, all the social posts and articles you craft hit a point of diminishing returns: The more you talk, the more people ignore you. What if you could get other people to talk about you on your behalf? I’m not talking about getting your recruiters to talk more on social channels, or even getting your employees to create content for you. I’m talking about getting the people outside your company, who you don’t pay or support, to talk about you so you don’t have to. This kind of thinking is referred to as “influencer marketing.” Your strategy is to market your company and your story to people who others listen to. You get them to become fans so that they can get their fans to become your fan. Generally, this is what you hope happens every time you tell your story: You want someone to find it so compelling and engrossing that they tell other people, creating a viral effect that penetrates people’s networks, ones you would otherwise not have access to. These people become town criers, traveling around and telling people all about how wonderful you are. But there are some serious drawbacks. That town crier may have little to no network. Their network may not relate to what you do. For example, if you are looking for IT staff, but your new random friend doesn’t know anyone in IT, what good was getting them to tell your story? Or even worse, the credibility of your new town crier may be negative, hurting people’s impression of you every time they speak your name. Instead of trying to get just anyone to become a fan, this strategy focuses on segmenting your efforts to reach people within a given industry or job role. So relying on the serendipitous fans might not get you where you want to go. Instead, you should focus on people you know will garner interest, people with influence in their industries or communities. Look at Amazon’s beginnings. What turned them from an online bookstore into the e-commerce store of choice is that they let their customers comment at length about the products they sold. You might not trust the glowing blurb on the back jacket, but when other people say it’s an interesting book, you begin to consider their input. And when the person suggesting that the book is worth your time, is an expert on the subject (one you’ve trusted for some time), you will likely put that book in your shopping cart. So if we want to leverage these influential people, how do we go about doing so? There are two schools of thought here and we recommend targeting both the role and the individual. Instead of trying to get just anyone to become a fan, this strategy focuses on segmenting your efforts to reach people within a given industry or job role. If you are trying to influence those within the nursing space, engaging people who have no nursing connection won’t help you. Hoping that someone who has no nursing connection happens to have a friend who is a nurse to receive your message is kind of like fishing in the desert, hoping someone throws a fish out of a plane. It’s not impossible or out of the realm of possibilities, but there are better ways to spend your time. You already do this to some extent. If you are trying to drive applications for cloud developers, you gear your advertising efforts to technical websites and job boards. Similarly, when targeting the role, you are marketing your content to attract the attention of other subject matter experts. This is a far more specific way of targeting than job role targeting. Instead of letting subject matter experts self-identify, we find targets to approach and, over time, encourage them to align to our brand in some way. We need to develop a list of influencers that’s big enough that we don’t need 100 percent success to be useful, but not so large that it becomes impossible to work with. To develop this list we first need to establish who those people are. We think about influence as being the intersection of a bunch of different ideas. We want someone who is knowledgeable on the subject matter, who has a large audience, and someone who is active in the social space. Without these things, we will be targeting someone who is either disconnected from the people we want to reach, doesn’t know enough people to be considered influential, or is so quiet that we won’t be able to engage them. If we shoot for a list between 25 and 100 people long, we can use tools like Klout and Followerwonk (both free) to search for people who are subject matter experts, and sort by audience size. Once we have a good list, we go into those profiles and validate that they are active. Then, we make a note of anything else within the bio or tweets that is of interest. For example, if it turns out the target IT influencer is also big into health care, that would be a useful thing to note, as we can get them interested with content also related to health care IT. Once we know who to target, the process is slow, but very simple. First, you follow all your targets and put them all on a Twitter list. Every day, you watch your target list and favorite and retweet things your targets post that are interesting. Don’t rush things. Don’t try to retweet a hundred things each day. Be opportunistic and only retweet really interesting stuff, and after a few weeks, your targets will start to recognize your Twitter account. The next phase is to look at your targets’ bios and see if they have blogs or other places they publish. 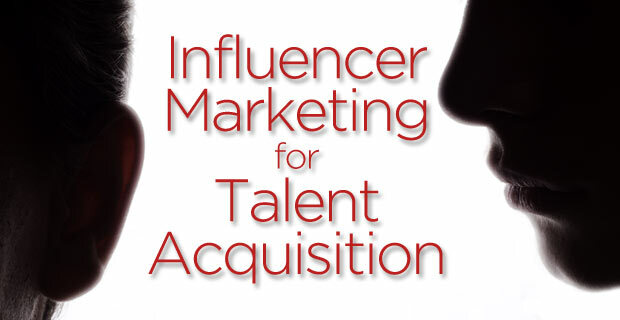 Influential people become influential by publishing, so stake out their websites. Spend some time commenting on a recent post or two. Again, this is slow and labor-intensive work, but will reap huge dividends. Why? Because people don’t comment on blogs much anymore, so your comments, especially if smart and well-considered, will stand out. It might make sense at this stage to bring in internal subject matter support. If you don’t know enough about IT to comment, get IT staff to help you out. Next, wait until you see one of your targets actively posting and join in the conversation. Reference recent news or work, or suggest other thinkers on the subject. Show yourself to be a thoughtful member of the industry who isn’t a spammer or blowhard and they will remember you. After that, start asking occasional questions or sending them interesting articles on the subject. The end result, however, is tricky. Once you’ve followed all the steps and created a list of influencers who think positively of you, you need an endgame. A simple and powerful endgame might be to create a big article or blog post using all your influencers as source material. Ask them to answer a single question or make a prediction and combine them all into one blog post. When you publish, thank them for their help and ask them to share your blog post. It will spike traffic and create an opportunity to expand your audience. An endgame may be more collaborative. You could ask them to guest blog on your site or let you guest blog on their site. Connecting your audience to theirs benefits both parties and you can use the post as proof that experts in the industry take you seriously. Of course, you could always ask your influencers to play a part in an upcoming project. If you have the budget, fly the biggest targets to your headquarters and show off what you’re working on. Ask them for opinions and make them part of the inner circle. Afterward, ask them to talk about their experiences at your offices. They won’t be 100 percent glowing, but the resulting press will grow your audience, traffic and organic search impact. If you can be patient and not try and make them your best friends in a week, this process is very effective. By being more selective in who you spend time talking to, you can grow your reach to people who would have otherwise never considered working for you.